Letters From A Tapehead: RSD 4.19: Deerhoof/Marc Ribot split 7"
RSD 4.19: Deerhoof/Marc Ribot split 7"
We're a little more than two months away from this year's Record Store Day and today I received my first item on this year's wishlist: Deerhoof and Marc Ribot's Ceramic Dog will be issuing a split 7" via Northern Spy Records. I'm hoping to have a stream to post at a later date. In the meantime, I have cover art and a small blurb courtesy of Northern Spy. A split 7" deserves a split write-up. So, I asked Deerhoof's Greg Saunier and Ceramic Dog's Marc Ribot to write something about this record. Turns out there's some mutual respect here. I guess it'd be weird if there wasn't. 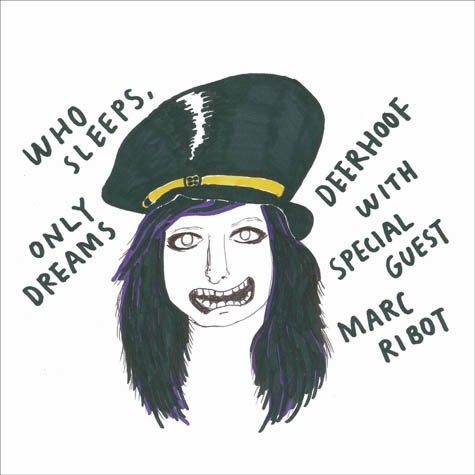 The Deerhoof track originally appeared as "Qui Dorm, Només Somia" on Deerhoof vs Evil. On this 7", Marc Ribot's guitar serves as the harmony in place of Satomi's vocals. It's RAD. And the Ceramic Dog tune is one of their heaviest. This is a Record Store Day vinyl release and will only be available at fine music retailers.